Since opening day at Jarigu on October 17th, 98% of the households in the village have visited the water treatment center at least once, while 74% have come a second time and almost 50% have come three times. These are some of the best uptake and sustained use results that we have seen in any CWS village! Getting some clean, healthy water at the Nyamaliga water treatment center! Peter and I have been very busy getting things set up in Jarigu this week. Here are some pictures from the past 7 days! One of the first steps in setting up a CWS water treatment center is building the polytank stand. We try to work with a local mason to build the stand, but since none of the men in Jarigu were experienced masons, Soufoo, our good friend from Nyamaliga, came to help! Halfway done and finished for the day. It may not look like much, but it took a lot of work! Thank you Soufoo! Since Kasaligu now has access to municipal water, we decided to move their water treatment center to Jarigu. This is something that we discussed in detail with the Kasaligu chairman and with Fati, the woman who works at the center. They were both happy to move their polytank to a new village that needed the treatment center (we will still be working with Kasaligu on safe water storage to prevent the re-contamination of the piped water in their homes, and Fati will be selling small Aquatabs that people can use to chlorinate their own water). Originally, Peter and I planned to rent a truck to move the polytank, but at the last minute Peter convinced me that we could use a taxi, which would be cheaper. A few hours and two runs-in with the police later, the polytank and the three blue tubs that make up the water treatment center arrived safely in Jarigu. Loading the polytank onto the roof of the taxi - apparently the Tamale police didn't think that this was a funny as I did! On Wednesday, Peter and I visited each household in Jarigu to distribute the CWS safe storage containers. Although it takes a long time to pass out the containers to each family individually, its a great way to make sure everyone in the village understands the project and the connection between water and health, and learns the importance of safe water storage through the use of water storage containers. Water can be kept safe and clean when stored in one of these. There are various sized containers available, depending on the need and quantity of people. As there is not always running water, it is only best for numerous amounts of villages to have access to these containers. It makes life just a little bit easier for the residents. Just like with any job, it was a LONG but fun and rewarding day! Attaching the tap to the safe storage container. On Thursday we also started water treatment training. Usually, we will work with members of the community to select two women to be in charge of the water treatment center, who we then train to treat the dugout water. The village then decides what time of the day and how often they would like the center to be open. 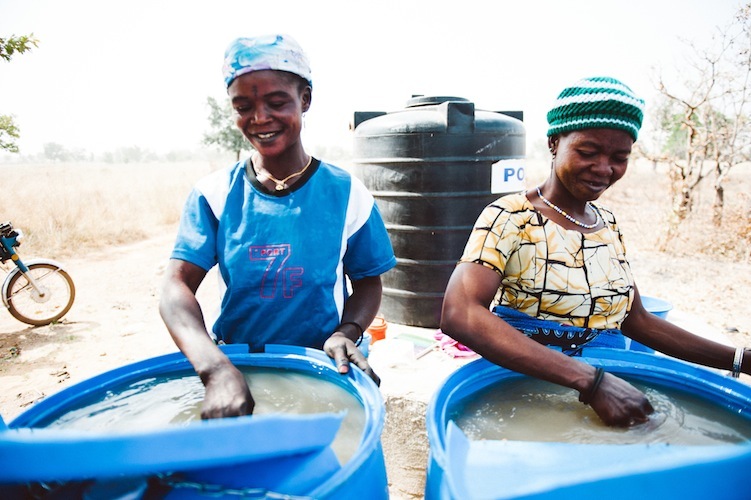 We like working with women because they are usually the ones in charge of all water-related household activities (collecting water, cooking, washing, etc) In Jarigu, however, we are doing things differently. This village already had a local man, Alhassan, “guarding” the dugout. He sits by the dugout all day long to make sure that no one walks too far into the water (this helps to prevent Guinea Worm contamination). Since Alhassan was already sitting right next to the water treatment center, the village thought that he should be the one in charge of it and we agreed. Since Alhassan will be at the dugout all day, everyday, the water treatment center can be open all of the time. While this makes it a little bit harder for us to monitor (instead of coming to the village for a few hours on the days the center is open, we will have to be there all day if we want to observe the center’s sales), it is much more convenient for our customers in Jarigu! Here are some pictures from our first night of water treatment training with Alhassan – he is a quick learner and very fun to work with! Step 1: Particle removal. We use alum- a locally available coagulant/flocculant for this step of the water treatment process. We usually add alum to the water in the evening, and by the next morning, the particles in the water have settled to the bottom and the water is clear. On Friday morning we returned to Jarigu for the second day of water treatment training with Alhassan. We transferred the water from the blue tubs (now “clear”) into the polytank and treated it with Aquatabs, a chlorine product that disinfects the water. Its now ready for opening day! Once the polytank is full, we disinfect the water using chlorine. Opening day in Jarigu was a big success! 34 families came to buy water from Alhassan and a good time was had by all! Thank you again to Susan and Greg Gintoff at Volunteer Shredding, LLC for sponsoring this water treatment center! Me, Alhassan and Peter at the water treatment center in Jarigu. Thank you Volunteer Shredding, LLC! Children hanging out at the CWS water treatment center on opening day.